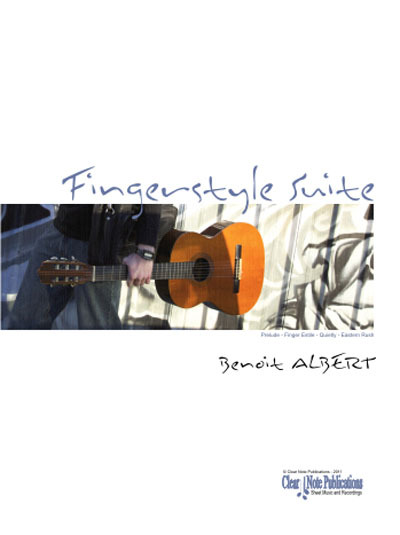 The Suite "Fingerstyle" is dedicated to the French Finger Picking legend Christian Laborde. Meeting Christian and the Finger-style milieu in the 2000's allowed me to reconsider the guitar as a more friendly and popular instrument. The suite consists of four continuous movements that borrow heavily from the styled "song" form (verse chorus). The final "Eastern Rush" has an arch structure, strongly influenced by Eastern European music. The slow movement "Quietly" is a tribute to Pat Metheny, following countless plays of "One Quiet Night", a disc that I would happily take with me to the proverbial deserted island. . . an atmospheric, improvisatory Prelude was the last piece added to the Suite, it serves as a unifying introduction to the other three movements.